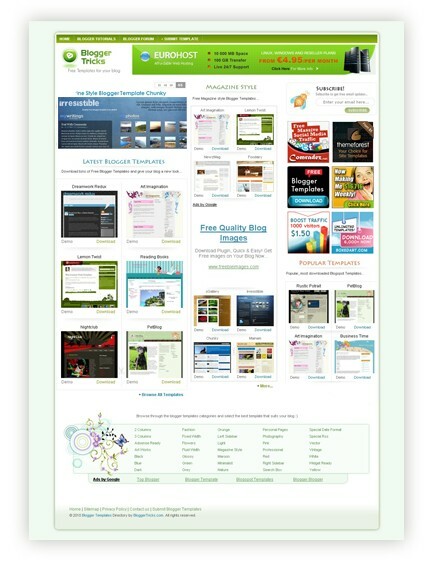 Also, I'm proud to announce the launch of our new bloggertricks addition "Blogger Templates Gallery/Showcase" website. (templates.bloggertricks.com). It is a blogger templates directory where we showcase some of the best blogger templates on the net by various famous designers. So, if you are looking for a new template for your blog, instead of searching tons of websites in vain,you can simply visit our site to download hundreds of new, unique and amazing templates on the net for Free. We arrange them in categories, so you can quickly browse through them and select the best template that fits your blog. To make it easy for you to decide on a template that suits your blog the best, we have also included a "Live demo" feature. All you need to do is simply browse through the template demos and download the ones you like. No more do you need to waste your time about downloading an inappropriate template; with the 'live demo',you make the right choice. Hi kranthi,i like your new blog layout,,yah,sometimes changes is needed. Oh ya kranthi,i always ask this question,and you always never answer this,i always visit this blog hope you answered,but its not. Here i will ask it again. .how to show author,post date,and label on schemer mag templates ? thanks,i hope this time you will answer. awesome ! i will not leave it site and being a fan of BT - will give 10 out of 10 for this template and the new new template collection! Oops..Sorry dude.. Actually.. I'm busy with my studies..that's why scared to open comments..haha... (around 4800 comments awaiting moderation).. I'll explain how to do it tomorrow..and will give you link. and Thanks to @ Beben, Anup and Rajesh..! Don't know if you are aware, but Google has a policy of deleting Blogger Blogs it considers spam (often they are not) without warning and without the opportunity to save your work. We are trying to raise awareness of this issue to other bloggers and offer tips and advice on how to avoid it. We have a new campaign gaining momentum with a Blog and Facebook page up. I am looking for the template like this! And congratulations to all BT fans for the addtion in templates section.